living every week like it’s shark week. Stephanie is a member of the Design discipline at AJ, with a focus on motion graphics and video editing. She works closely with her team to create meaningful stories and elevate design for AJ’s clients. 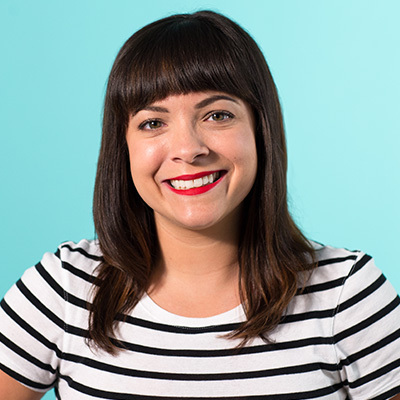 Stephanie has worked in the industry for over 10 years, creating content for brands such as LG Electronics, Unilever, JLL, Toyota, Hitachi Medical, CARE, AbbVie, Accenture, Harvard Business School & the University of North Carolina. One of Stephanie’s proudest career moments was when she worked with LG Electronics to create animated videos that played on their video billboard in Times Square and their large canopy screen along Fremont Street in Las Vegas. With a background in fine art, creating things has always been a passion for Stephanie. She stays creative outside of the office by dabbling in crochet, film photography, and hand lettering 90s song lyrics.